VG207 is a second phone in the line of VK Mobile, as CG107 and VG107 are the same handsets, which have different design. 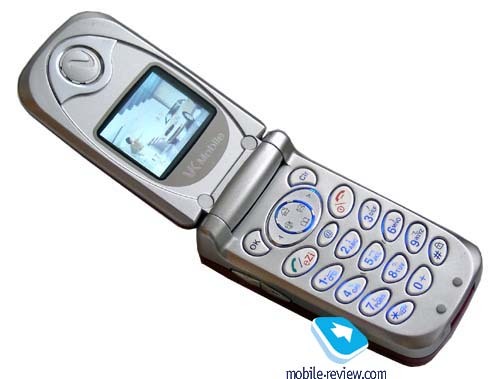 While creating VG207, VK Mobile most likely oriented on Samsung T500. These two models have much in common, but VK is smaller (73x42x22 mm). Both handsets resemble each other in a lacquered cover. 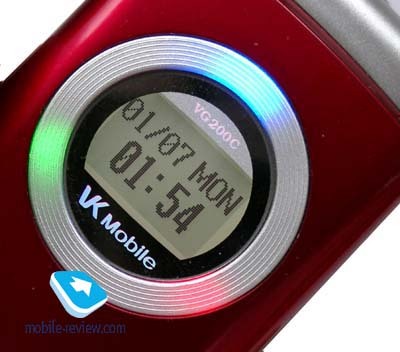 VK VG207 is available in three colors – red, blue and white. Quality of the covering is excellent, but nevertheless it can be scratched within the time and you could see a silver plastic under it. If you use your phone carefully, we doubt that you’ll have such problems. But our mission is to warn you about possible troubles. 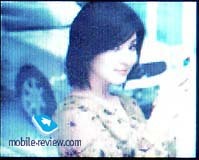 This phone is aimed specially to women and, hence, it is lightweight. The handset weighs only 70 grams. We think that VG 207 is based on the same platform as CG107/VG107. The main changers are screen concerned. 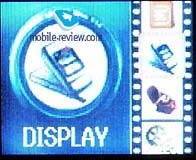 An external display has a resolution of 80x48 pixels. 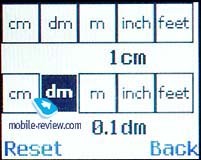 According to the manufacturer, it could show up to 4 text lines, in reality there is no any available mode on the phone, which can display such number of text lines. 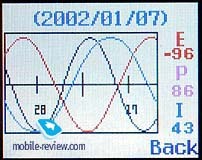 Just a service line, indicator of the signal strength level, battery status and one line of text information are shown on the screen in the standby mode. A second line is changed to name and phone number while incoming call. The external display has a pastel blue backlighting. On the contrary to other (previous) models, the color of the backlighting can’t be changed, but there are three LED, which are integrated in a silver rim around the screen. They have different colors and you can select anyone you like or just set one of pre-default color schemes. Loudspeaker is placed on the lower part of the front cover. This kind of phone’s construction enables to increase volume of the ringer without increasing loudspeaker power. A system connector is positioned on the bottom of the phone, portable handsfree connector is located on the top of the handset. 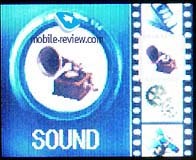 A double volume button can be found on the left hand side. If you open the phone, you’ll see an internal screen, it is rather large. 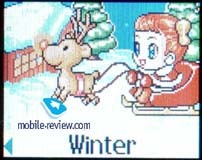 The resolution is of 128x96 pixels, what allows to display up to 5 text lines and one line with tips to the soft keys use. This handset has a color (up to 65000 colors) STN screen. 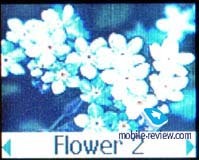 But colors look not so bright as on the phones of other manufactures, which have the same matrixes of displays. The picture is dim and little bit not focused. 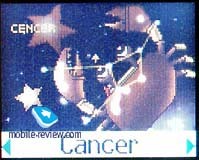 Probably, a low screen resolution doesn’t allow to show graphics well, text is displayed without problems. Keypad is made of plastic, keys are of average size and they spaced well. 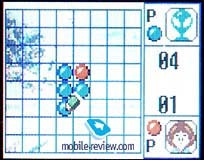 The phone is equipped with a 4-directional navigation key. Several menu items are assigned to it to access them quickly. 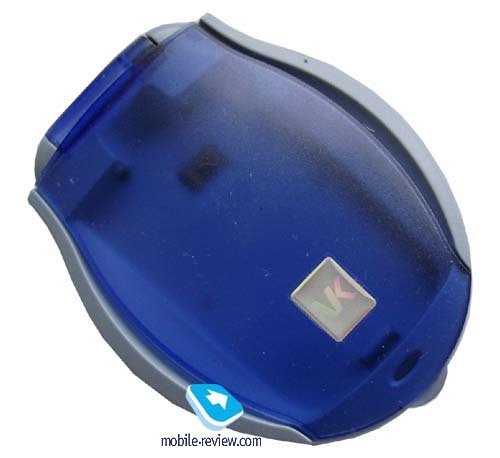 Keypad has a blue backlighting, characters drawn on buttons are slim and not always visible. Two battery types are included in the standard delivery kit: lithium-ion batteries of 620 and 720 mAh capacities, respectively. Declared time of operating is up to 100 (120) hours in the standby mode and up to 150 (180 minutes) in the talk mode. So, the autonomy of the new phone and its predecessors is the same. In reality the handset worked about 2-2.5 days in case of 15 minutes of talking and 20 minutes of using other applications. Color screen reduced a total autonomy by 12 hours. Time of full re-charging of the standard battery is about 2 hours. In response to features, this phone is almost identical to CG107, only a new game was added and a main menu interface was changed. Shortcut number navigation is available. Let’s review the main phone applications. But don’t surprise when you notice the same text as in CG107 review, because realization of most functions is the same. Phonebook. Up to 100 phone numbers can be stored in the phone memory. But only one number can be added to one name. Up to 8 phone numbers can be assigned to speed dialing. 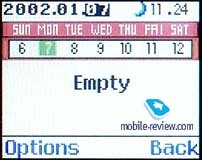 The phone displays phone numbers from both memories: phone memory and SIM-card memory. There is a search by name and phone numbers. In general, this phonebook offers standard possibilities. Messages. Up to 20 messages can be stored in the phone memory. The handset supports only SMS-messages, not EMS and MMS. There is a predictive text input – eZi, similar to T9. In out phone it was available in Russian and in English. In general, the phone always supports two languages: English and language of the county, which the phone is supplied to. Display. It is the first item of the main menu. 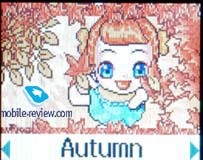 You can select one of 6 animated pictures (seasons, children) or any other pre-installed picture. Varity of available pictures is really great. Besides it is stated that you could download your own pictures. 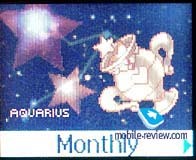 Among pre-installed pictures you can select one of the 12 zodiac animals; they can be automatically changed depending on the month. There is also a set of funny pictures. Besides, you can set clocks (digital, analogue, 2 time zones), calendar (monthly and weekly view), just a text or simple picture with nature scenery. Sound. The phone supports 40-tones polyphony. It sounds very pleasant. Polyphonic ringer is realized wonderful in this phone. Volume of the ringer is sufficient not to miss calls in quite places. It is not so loud as phones from Samsung or LG. Totally up to 32 ringtones are available in the phone. 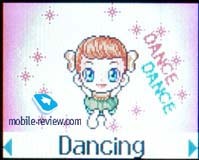 There are several types of incoming alert: just melody, vibrating alert and mixed mode. You can set the same types of alert and ringtones for alarm-clock. There also 5 tones, which sounds when you call is connected to the system. Phone set. 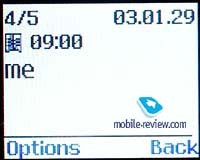 Several settings are hidden here, including date, time and alarm-clock. It can be defined as once or daily repeating. You can also set power on/off alarm function. Besides, you can set a backlighting of the external display here. Other settings are standard. Call set. All settings, which calls are concerned, are located here. For example, calls divert, call barring and etc. Secretary. This menu gives you access to an organizer. You can view the calendar here (weekly, monthly). 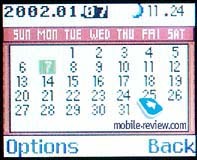 The phone supports different events (schedule, call, memo, anniversary). It is possible to set a signal reminder. A pleasant peculiarity of the calendar is that it displays a phase of Moon for every day. 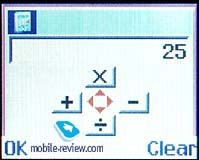 Calculator is convenient due to a navigation key use. Unit converter is standard, a separate currency converter is not available. 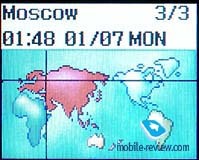 World time feature enables to view time in the largest cities of the world. Private. This menu allows to view the information, concerning calls duration, and up to 10 personal records (for example, numbers of your credit cards). This menu can be closed by a password to be sure that the information won’t be used unauthorized persons. As the phone is aimed to women, there are biorhythms and biocyles counters here. Games. There are three pre-installed games in the phone: JumpJump, SpaceBall, Othello. The sense of the first game, I didn’t understand even after reading the rules. 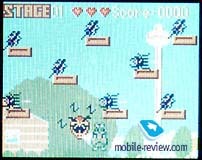 The second game is an original version of Snake. 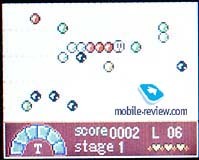 Different types of balls are located on the gaming field. When a snake swallow the ball, it grows to snake’s tale. If the snake swallows three equal balls one by one, they are removed. Your mission is to swallow all available balls and remain with short tail. It’s very captivate game. The third game is also rather captivated. Internet. The phone has wap-browser in verision 1.2.1. It works without problems. As you could see the main differences from the younger model are a new desing, color internal screen and a new game. 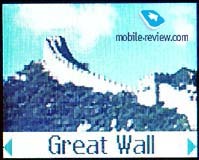 The phone is not bad for those, who purchase a clamshell handset for the first time. Ladies will be satisfied with polyphonic ringtones. 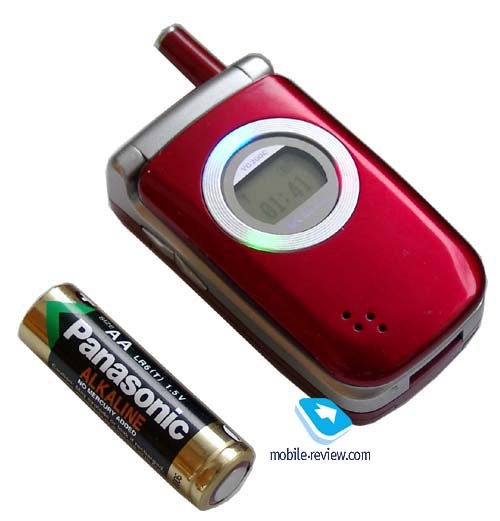 Vibrating alert is average, you can feel it if you wear the phone in the pockets, not in a bag. Sound quality is pleasant, you can hear a person on the other side of the phone line without problems. Unfortunately he/she can not always hear you, as an integrated microphone picks up surrounding noise. We can’t recommend this handset to purchase, taking into account its retail price – 400-450 USD. Theoretically it is a good phone, which costs 200-230 USD, not much. In our opinion it is too expensive, even if to pay attention to its rich standard delivery kit. VK Mobile knowingly constricts production market because, nobody will buy expensive phones made by not famous company, having alternative and sometimes cheaper offers. We assume that the company will have to reduce phone’s price to 300 USD in near future, but even in this case VK VG207 will remain an expensive model.